Butterfly at 5 Minute Marvels! Check out this new Butterfly fan art from my pals over at 5 Minute Marvels! Thanks, Grace and Tim! Here’s Flutterfield, Butterfly’s My Little Pony universe counterpart. Make your own with the Pony Creator MLP Generator! Click here for a special Butterfly guest strip for WarrenEllis.com. Thanks so much to Mr. Ellis for the invite. This oil spill is going to be with us for a long time, and is the result of human error, not just in the unsafe design of BP’s deep water oil drilling machinery, but also in our lax regulations of such endeavors. It’s times like this, when millions of people are affected by decisions that favor profit over people that I most wish superheroes like Butterfly and Tree-Man were here to save the day. For details on the organizations our fundraiser is supporting, click here. 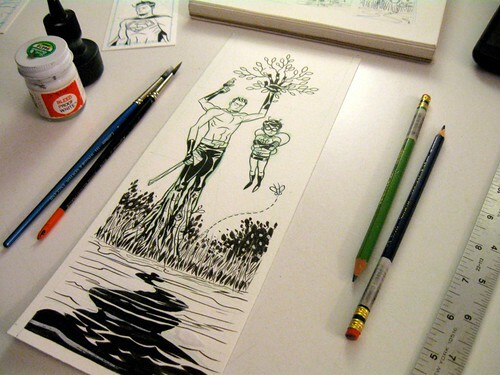 Process shots of this hand inked drawing can be found here. Since I tend to draw the Butterfly comics digitally (when Jemma’s not handling the art chores far more capably), this is a rare chance to pick up original art by me featuring the lil’ guy. And of course, help support those whose lives have been affected by the oil spill. It’s a win-win. If you’re looking for more content from me while Butterfly’s on a break, Project: Rooftop‘s back and going strong, I’m posting art at my new Tumblr blog, deviantArt, and of course, Twitter. Thanks for still caring enough about Butterfly to be checking in. Butterfly will return! Inspired by John Campbell’s awesome example, Butterfly finally took the Hourly Comic challenge! Oof, Butterfly’s hourly comics got derailed by his after-school swimming party. Looks like he’ll be out for the night, so that’s all of his hourlies! Hope you enjoyed them! Thanks as always to John Campbell, Famous Person.